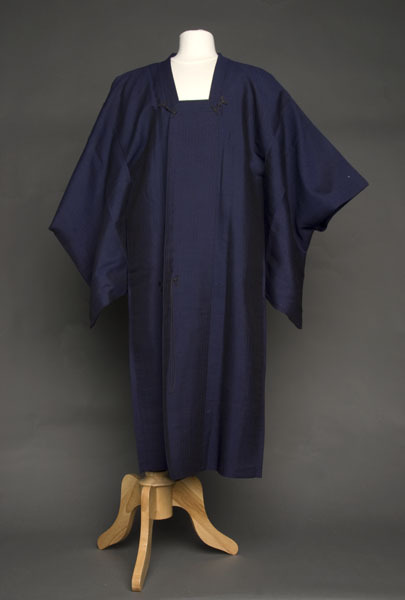 1 michiyuki (visiting coat) : silk ; 43.75 x 22.5 in., right sleeve 22.5 x 12.25 in., left sleeve 22.75 x 12.5 in. Navy blue chirimen (pebble crepe) michiyuki (visiting coat) with subtle vertical stripe woven into fabric; body lined with gray, blue, brown horizonal striped habutai silk for 27 in. and navy chirimen at bottom, sleeves fully lined with striped silk. Two black decorative knots sit at corners of 1.125 in. square neckline collar; two decorative knots with long ties at the front waistline. Two short navy blue fabric ties are located inside of coat at waist to secure front. Dimensions of sleeves are not exactly the same. Handwoven silk michiyuki with Chinese front was worn by an Issei woman. It was given to Barbara Kawakami by Waipahu Soto Zen Taiyoji Fujinkai (Women's Association).